POTTERY AVENUE'S large Polish Stoneware bowl with handles will be a featured piece in your collection and a welcomed gift. 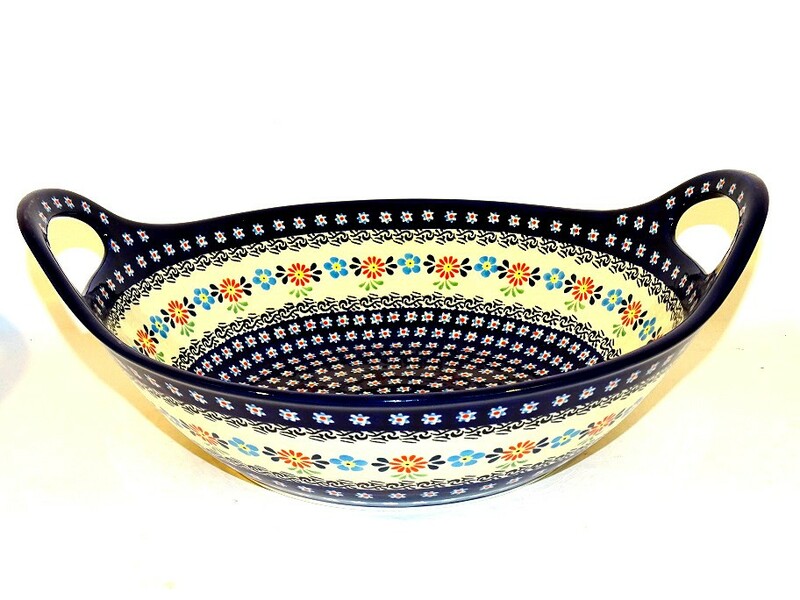 POLISH POTTERY | POLISH STONEWARE 13" HANDLED BOWL-BAKER FEATURED IN CLASSIC HERITAGE *This large Polish Pottery bowl with handles will be a featured piece in your collection and a welcomed gift. This is one of the most versatile pieces of Polish pottery available. It is beautifully decorated both inside and out and stunning on display. Fill it with fresh fruit or even popcorn balls. It is perfect for serving salad to a crowd or potato chips at the party. And, because it is Polish pottery and can go from oven to table, you can use it to bake a chicken, roast or for mac n cheese in addition to heating and serving anything . I promise you will love this bowl. Fit for any current or aspiring gourmet. *Microwave,oven,freezer and dishwasher safe. *Each Item is certified to bake up to 480 degrees and will make everything you cook a work of art! *Stoneware must be room temperature prior to use in a microwave or hot oven. Avoid drastic temperature swings. *Do not put close to the heat source such as the broiler or bottom of the oven. Do not put close to the heat source such as the broiler or bottom of the oven. Each Item is certified to bake up to 480 degrees and will make everything you cook a work of art! Stoneware must be room temperature prior to use in a microwave or hot oven. Avoid drastic temperature swings. A national treasure, Boleslawiec ceramics have been manufactured for centuries. Developed from natural ceramic clay that can be found near Boleslawiec at the Bobr and Kwisa rivers. According to historical sources, the first stoneware was made in medieval times and in the early 16th century, local potters formed guilds to ensure perfection. Zaklady Ceramiczne "BOLESLAWIEC" was founded by one of the original men with the first pattern dating back to 1759. "HERITAGE 13" HANDLED BOWL-BAKER" is a CLASSIC pattern based of the 300 year old pattern "EYE OF THE PEACOCK". Designed by top designer and imported by Pottery Avenue, the premier importer of Polish Pottery & Polish Stoneware.